It’s Vinyl for the Front Porch and Entryway! What’s the first part of your home visitors see? Why yes, it’s the front porch and entryway! My purpose today is to help you “own” that first look with the right first impression. 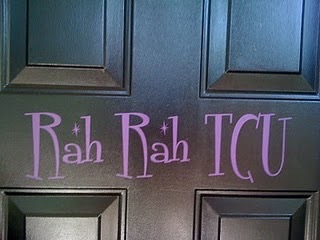 Ever seen this done before, on the front door? Yeah, me neither! But what a cool idea to show your team spirit or celebrate the holidays with cute phrases! And I can guarantee you this; you’ll be the only one in your neighborhood with an awesome vinyl-y decorated front door! How’s that for a smashing design guarantee? Bienvenidos! Bienvenue! Aloha! Willkommen! Benvenuti! Welcome! Say it however you want, the meaning is the same – You’re welcome here, and please come in! What’s more important than family? Nothing! So, express it through vinyl so everyone knows without a doubt what your highest priority is and always will be! Ah, so sweet is the love of a mother or sister or brother! Whoever you are, and wherever you may be in the world, you know how important family is and consequently how important the home is. From the moment visitors step foot in your home, they’ll have a good sense of what kind of people you are. So, show the world what your family bond means to you!